This is my card for the Digital release using an image called hummingbird from designer Dana's Digi's. I wanted to try an new technique with this card. I always use foam squares to give my cards a 3 D look. So I tried doing a 3D paper piecing card. I didn't get as in depth as I could have but, I wanted to try it on an easy level. I only did a few layers but it is alot of work and cutting. The effect was so wonderful, the photo doesn't really justify it. But I had fun doing it. A closer look at the paper piecing of the flower. Supplies: Copic markers, Digital image and Treasured moment tickets from Whimsy Stamps, Kaiser patterned paper, Bazzill cardstock, Decorative Labels Eight from Spellbinders, Kaiser craft pearls, foam squares. WOW!!! What a gorgeous card!!! Such gorgeous coloring and gorgeous colors!! OH WOW!!! Super coloring!! I love how you so beautifully colored the bird! What a gorgeous card. Love that you have tried the 3d effect. Just too bad you can't really see it on the big picture. I really like the 3d. The colors you used are gorgeous! Lovely card Charlene. 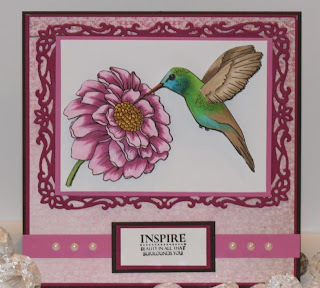 Thank you for your inspiration on this blog hop. My goodness. That is a lot of work and it shows. It's a beautiful card. The hummingbird is as pretty as the flower. Nicely done, sure is pretty...hummingbird awesome! Gorgeous my friend! Fabulous card! I love your paper-piecing and how it makes the flower just "jump" right off the card. Love, love, love it!!! Thanks so much for the inspiration!